Google Tag Manager is a free tag management system that allows you to quickly and easily update tags and code snippets on your website or mobile app, intended for traffic analysis and marketing optimization. Individuals who need to track a lot of stuff on their website as having a lot of codes placed in all sorts of places of the site; Google Tag Manager (GTM) is the ultimate & user-friendly solution. Mainly, you put all your codes in GTM and put just one code on your website. Install Tag Manager to add and manage Analytics page view tags, AdWords Conversion Tracking tags, and others in the Tag Manager User interface. 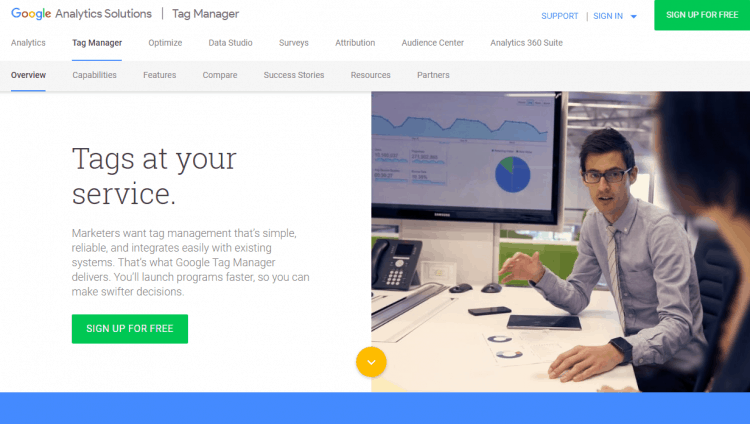 Start using Google Tag Manager. # Create an account, or use an existing account, at tagmanager.google.com. # Create a new container for your website or mobile app. # Install a container in your content. For web and AMP pages: Add the container snippet to your site and remove any existing tags. # Add, update and publish tags.